Brunch is one of my absolute favorite meals. And although some items found on a traditional menu certainly can take a toll on the waistline, that doesn’t always have to be the case. 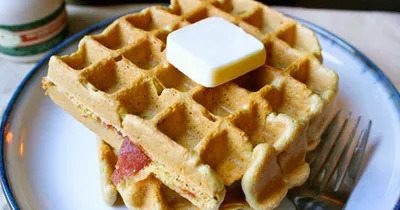 Belgian waffles, bacon, pancakes, eggs—the choices are endless but all can be made relatively healthy if you find the right ingredient substitutions! Personally, Belgian waffles with a side of bacon is one of my favorite dishes, so when I found this recipe for Maple-Bacon Waffles I knew it was just the thing I wanted to tackle for this week’s recipe makeover. Using the below substitutions, I was able to create a delicious brunch that held me over all afternoon and tasted just as delicious as the original! These waffles were hearty and filling thanks to both the white whole-wheat flour and the turkey bacon. Although less crispy than the regular pork variety, the turkey bacon added a subtle smokey flavor while still complementing the texture of the waffle overall.